Blood Orange Frozen Berry Smoothie, a simple smoothie recipe featuring winter citrus, frozen berries, leafy greens, and chia seeds. Let’s celebrate citrus season! Optional: protein powder, matcha, adaptogens, seeds, etc. 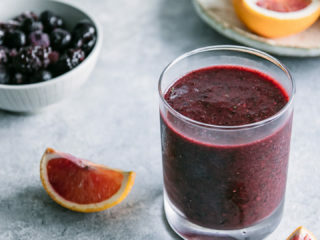 Combine blood orange, frozen berries, leafy greens, orange juice, chia seeds, and ice cubes in a blender or food processor. Blend until smooth, pour in a glass, and enjoy. Notes: Make it a bowl! Use this Blood Orange Frozen Berry Smoothie recipe as the foundation for your next smoothie bowl. Top with colorful winter superfoods such as hemp seeds, sprinkled chia seeds, or freeze dried fruit. Make it a meal by making this smoothie recipe more filling by adding oats, chia, or a protein like yogurt or protein powder, along with healthy fat such as nut butter. Nutrition notes: nutrition information calculated without optional add-ins.